Signal Communication Systems is an authorized dealer for ESI. ESI offers powerful telephone systems and solutions for every industry using powerful digital and VoIP technologies! 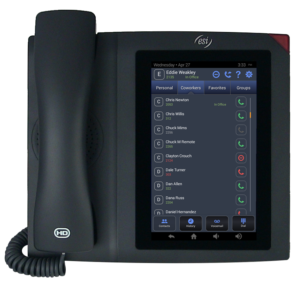 The purchase and installation of an ESI telephone system provides all the traditional benefits of equipment ownership including ease of use, long term savings and control of your entire communication infrastructure. ESI telephone systems are so advanced they are actually easy to use! These high power business tools can provide an all in one solution of Telecommunications, Voice Mail, Unified Messaging, Video and Call Logging, Access Control and Presence Management. ESI telephone systems integrated applications eliminate managing multiple vendors. No matter what business you are in, Signal and ESI have an ESI telephone system to meet your needs. Keep your business operating at peak efficiency as you grow and expand. Who is ESI? An ideal solution for those that do not want to invest in the “backroom” switching equipment outright, but still have a nice compliment of basic telephone system features may find Cloud services the solution that best fits their needs. 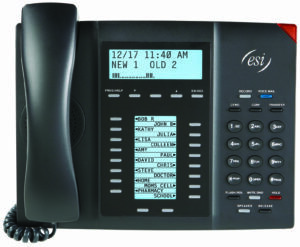 ESI takes this to the next logical step and blends many of the beneficial and proprietary ESI telephone system features and through the power of IP delivers them to you, your only investment is in the connectivity, your ESI telephones are included in the low monthly cost. All communication and data services ultimately rely on Carrier Services to provide the connectivity to other users or the cloud. At Signal we work with a number of providers in order to offer the best individual recommendation for every customer’s needs. We are always happy to assess your connectivity needs either by your description or by reviewing bills from your existing carriers to ensure you are getting the most bandwidth and voice capabilities for dollars invested. Whether Analog, Digital or SIP Trunks, PRI, POTS, T-1’s or Integrated Circuits we can assist with your needs. ESI offers SIP Trunking which provides both local and long distance calling to USA, Canada and Mexico bundles. The Essential Bundle includes 500 minutes of calling per trunk, each additional minute is 2.9 cents per minute. Conferencing is 3.5 cents per minute. The Peak Bundle ($21.95/month) features UNLIMITED calls and includes 120 minutes of conferencing per month. When connected to ESI telephones Bursting is including which is like having 50% more phone service for free!